The photo above is from the 2016 Palm Sunday Choir Festival, held in our sanctuary on March 20. The combined choir sang Mozart’s “Ave Verum” and “They That Sow in Tears” from Alfred R. Gaul’s The Holy City, conducted by Marcia Tomlinson. 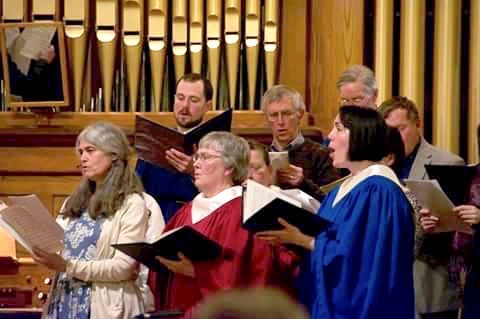 On August 28, 2016, the Jeremiah Ingalls Singers from Newbury, VT led our worship service with their singing of Ingalls’ beautiful hymns from the late 18th century. For the third Sunday in Advent, we performed Light of the Stable by Steve & Elizabeth Rhymer. Randy Odell on guitar, Bridget Peters, Storme Odell, and Marcia Tomlinson on vocals. Click for more Music News & Recordings. 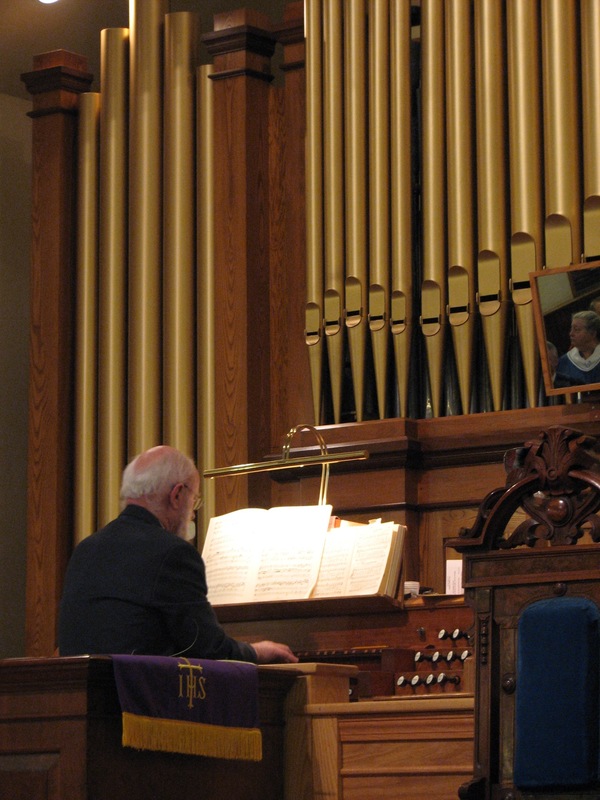 Bradford Congregational Church, UCC has a long history of both honoring and sharing fine music. The sanctuary is filled each week by the beautiful sound of our recently restored organ, played by master organist John Atwood, who also directs the small but faithful choir. In summer months, we host a series of guest musicians during the Sunday service, who bring a wide variety of music to our sanctuary, from traditional to contemporary to folk tunes, on a variety of instruments. The church also hosts two very special musical events each year: the Katrina Munn Memorial Concert in the fall which features a guest organist, and the Palm Sunday Choir Festival which brings church choirs from all over the region for an wonderful evening of music. About our organist and choir director: At least a sixth generation Vermonter, John Atwood was born and raised on a dairy farm in North Bridgewater, Vermont where he learned to play the piano at age 3 and later studied with local piano teachers including Helen Hathorn, Hilda Robinson, Beverley Newton (Wells), and won several awards in piano while in high school. With A. David Moore he was given a tracker pipe organ originally built in 1852 from a Woodstock church and repaired it to playing condition during the summer of 1964. He went on to get a B.A. degree in music at the University of Vermont with David Kinsey, then apprenticed for three years with the organ builder, Charles Fiske of Gloucester, Massachusetts. While at the Fiske shop he studied organ with noted organ historian, Barbara Owen and Frank Taylor, teacher at Wellsley College and a student of Melville Smith noted for his recording of Nicolas DeGrigny. Also during this time he substituted at the Episcopal Church in Ipswich, Massachusetts under Thomas Forest Kelly, then teacher at Wellsley College specializing in early music. During an interim 29 year period he studied tropical floristics with John H. Beaman at Michigan State University where he received his M.A. in Botany. He went on to work with Norris H. Williams of Florida State University studying the orchid family and received his Ph.D. in Biological Science in 1981. He went on to serve the Marie Selby Botanical Gardens, Sarasota Florida for 21 years, working off-site in Vermont for the last three years. During this time in Vermont, he organized two recitals for the rainforest featuring the famous Hutchings-Plaisted organ at the Unitarian Church in Woodstock, Vermont. He also organized the “Whitney Organ Recital Series” featuring this organ, an annual event that commemorates Woodstock-born organist and choir master to the Church of the Advent in Boston and who was one of the founding members of the American Guild of Organists. 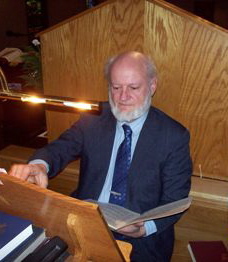 He joined A. D. Moore, Inc. organ builders located in Pomfret, Vermont in 2004 while serving as substitute organist for several years. During this time, he studied approximately half of the 45 pieces in J. S. Bach’s Orgelbuechlein with Donald Kerr. John is currently on the Executive Committee of the Vermont Chapter of American Guild of Organists. He was named organist/choir director at the Bradford Congregational Church, United Church of Christ, where he has remained since 2011. The church’s organ was restored in 2008 by Russell & Co. Organ Builders. You can find information about the history of the organ and the restoration here.